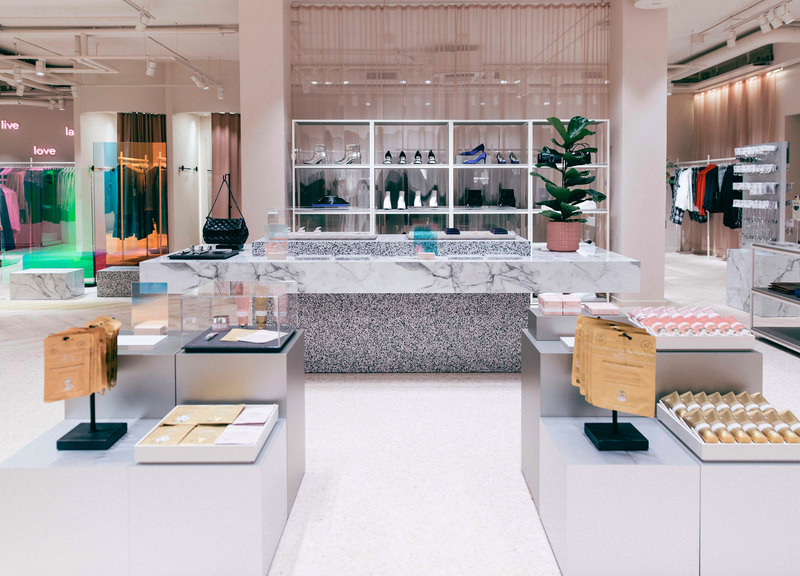 Note Design Studio and Open Studio sampled from a wide material palette to complete the interiors of this clothing store in Stockholm, which combines metal, coloured glass, and terrazzo-style surfaces. Decked out with boldly contrasting display fixtures, Gina Tricot has been collaboratively designed by Note Design Studio and Open Studio to be “a showcase of materiality and tactility”. 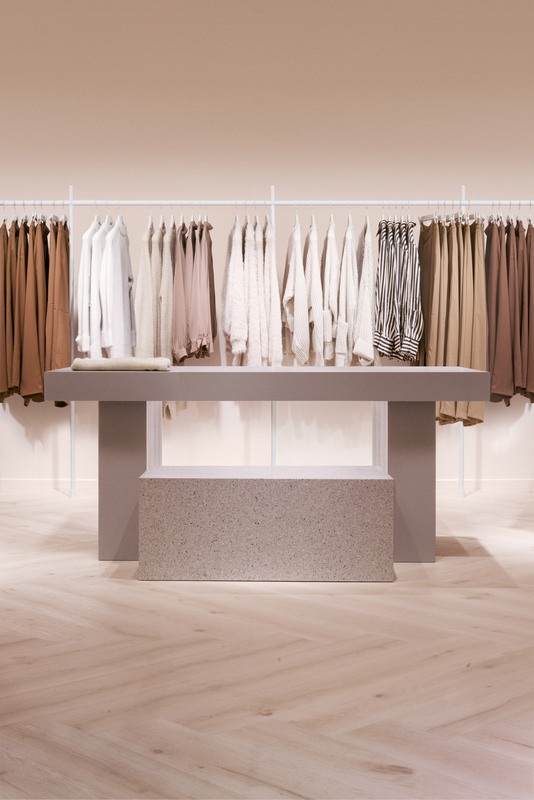 The store occupies a period building along Götgatan, a major shopping street in the artsy Södermalm district, and is the fashion label’s flagship. Its interiors are designed to serve as a blueprint for the design of all future Gina Tricot retail spaces, kicking off the brand’s wider aesthetic overhaul. “There’s a base of these calm and harmonious colours, which we’ve spiked with pop colours and textiles in various spaces,” Daniel Heckscher, interior architect at Note Design Studio, explained to Dezeen. Arranged over three levels, all of the shop’s walls have been painted pale pink and fitted with bubblegum-coloured neon arrows that direct customers to different departments. Contrast is offered by blocky plinths dotted throughout the space, which display small accessories or beauty products. 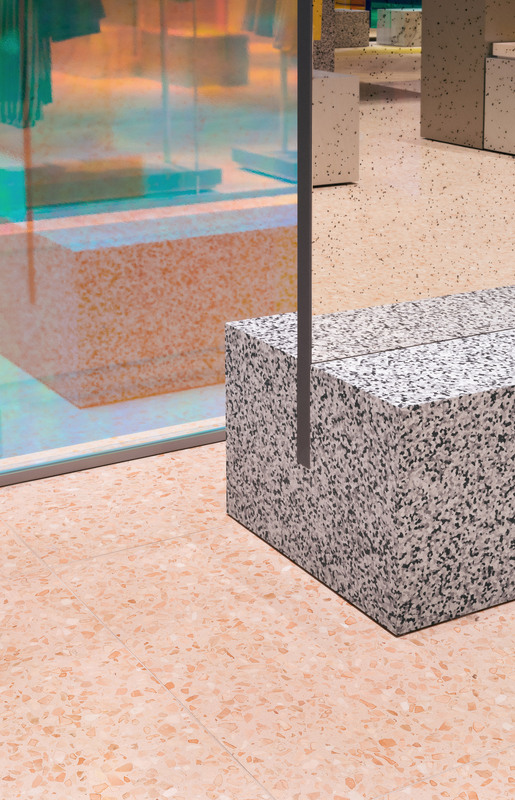 Some are crafted from veiny white marble, while others are clad in terrazzo-style vinyl from flooring brand Tarkett. Note Design Studio also used this material for the surfaces of an installation at last year’s Stockholm Design Fair. “Instead of funnelling the visitor through a pre-set customer journey, the new store leaves the customer to make decisions,” said the studio. An iridescent glass box has been erected over a stairway that leads to the basement, complemented by tinted panes of glass that have been placed in front of a handful of the shop’s clothing rails. The material palette is further diversified by the store’s large cash counter, which is fronted by mottled silver metal, and the chevron timber floorboards. 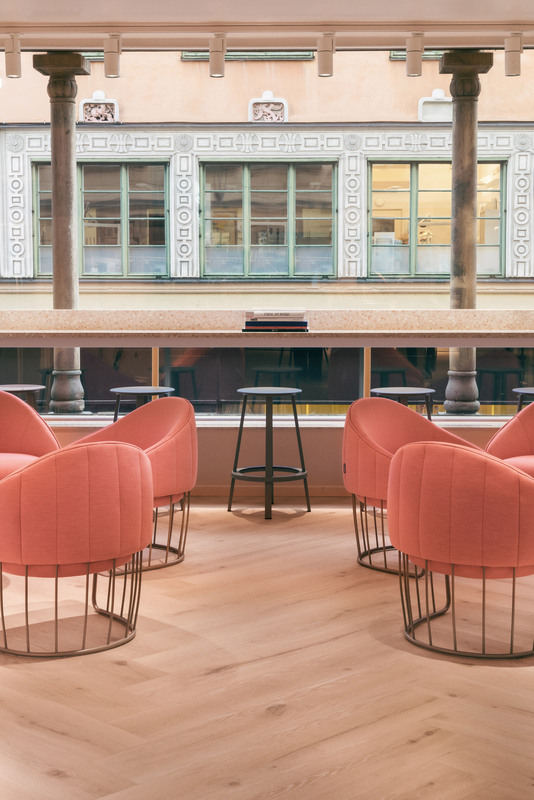 A cafe has been created on the shop’s third floor where customers can grab a snack or relax on one of the salmon-toned armchairs. The formally cramped changing rooms have also been overhauled to feature curtained cubicles and a central sofa, which the studios hope will foster “a sense of togetherness and camaraderie”. 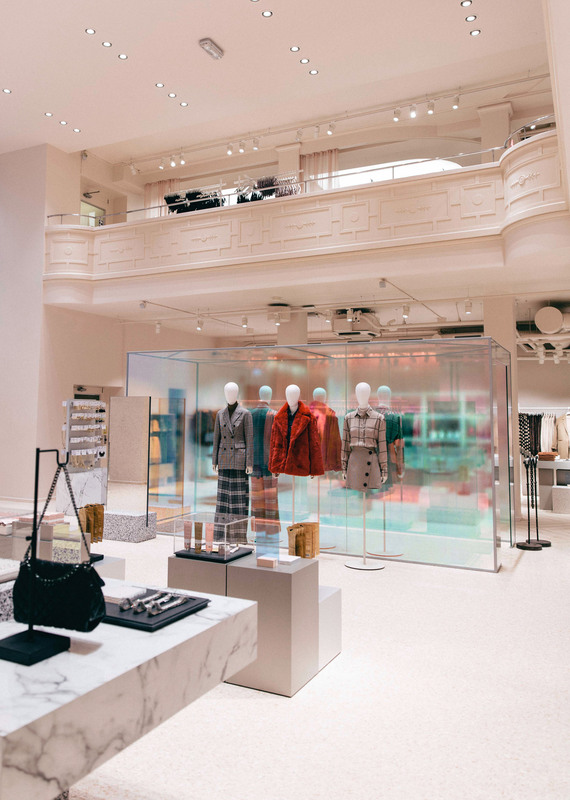 Gina Tricot isn’t the only retail space to feature an unexpected mix of materials – the recently opened Valextra store in Miami pairs metal mesh display podiums against pebble-dashed stone floors, while the Eytys shop in London has reflective aluminium shelving and rough concrete walls. The post Stockholm’s Gina Tricot store features medley of materials appeared first on Dezeen.